Most plant viruses are made up of nucleic acid (genetic material, usually RNA, more rarely DNA) in a protein coat. They are what is known as “obligate parasites”, in other words they can only gain nourishment from another living organism in order to grow and reproduce (a minority of fungal plant diseases such as rusts and powdery mildews are also obligate parasites). 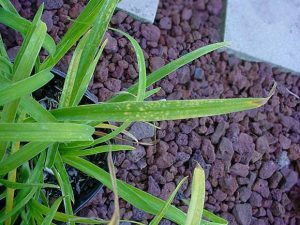 Once a virus has entered a plant, it is able to replicate by inserting its genetic material into plant cells and using them to produce more of itself. 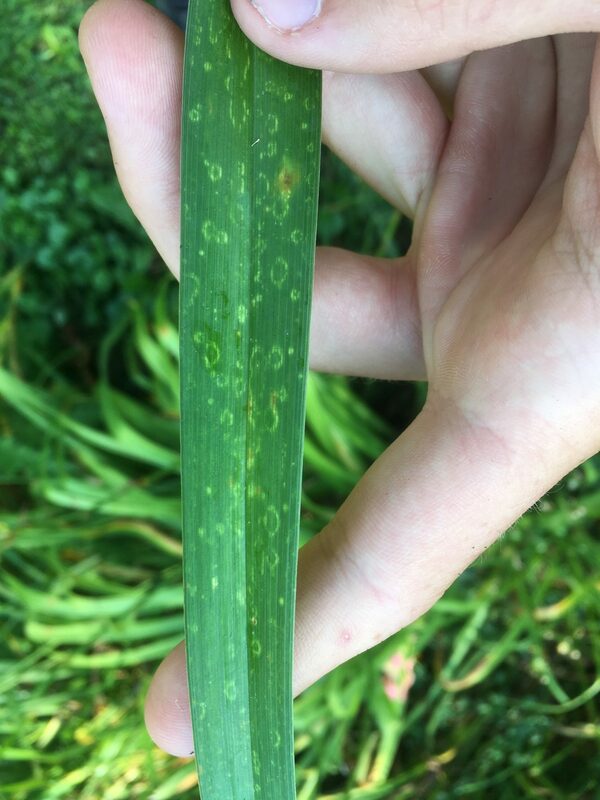 Symptoms of viral infection may be latent (no visible affect on the plant), may reduce growth (common), or result in any of several other symptoms including visible marks on foliage or flowers such as distortion, yellowing, mosaics, spots, streaks, and mottling. There is generally no treatment available for an infected plant. Some viruses can be transmitted mechanically (such as during handling and division of plants), and some by vectors such as nematodes, grasshoppers, aphids, thrips, spider mites and flea beetles, which introduce viruses by feeding on infected plants and then subsequently on healthy ones. Some viruses can also be transmitted by pollen and seeds. How a particular virus is transmitted depends on the specific virus and the susceptible plant. 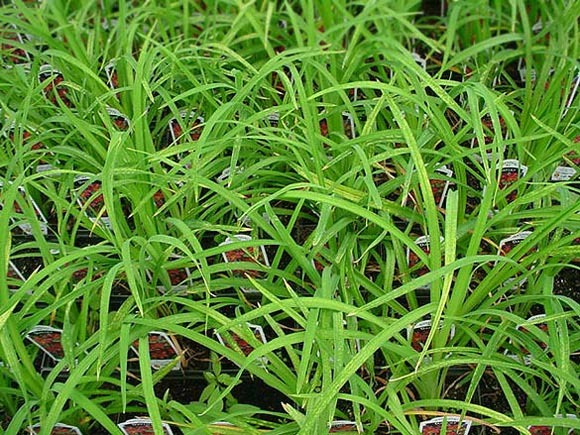 Daylily gardeners are advised to watch out for unusual symptoms, but be aware that other conditions like pest, non-virus disease, weather damage, nutrient imbalance, and chemical injury such as from pollution or sprays may resemble virus symptoms. The only way to determine for sure if a plant has a virus is to have it tested by a diagnostic service. 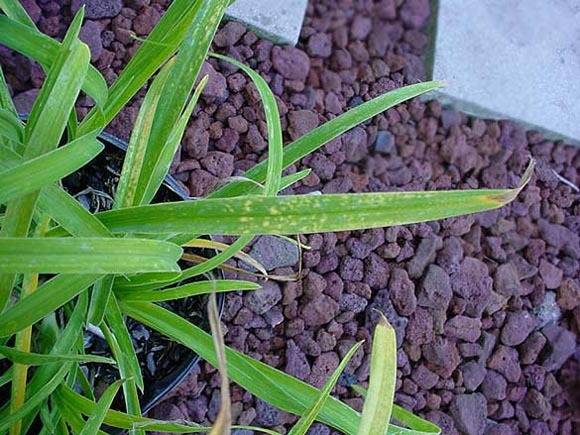 Several viruses have been reported in daylilies, including TRSV (tobacco ring spot virus), ToMV (tomato mosaic virus), INSV (impatiens necrotic spot virus) and CMV (cucumber mosaic virus). 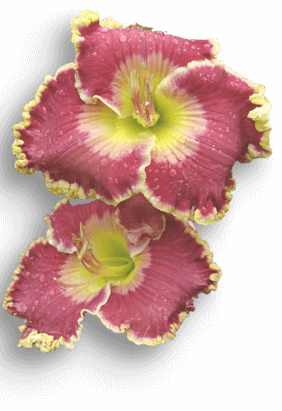 Currently we only have images to illustrate daylily symptoms of TRSV and CMV (see below). 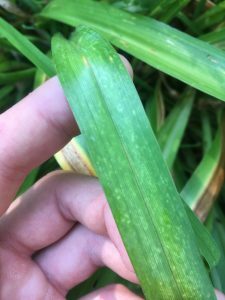 If you suspect a daylily in your garden may have a viral disease, remember that once a plant is infected with a virus there is generally no treatment and the plant will likely be infected for the remainder of its lifetime. Any divisions taken from that plant are also likely to be infected, as are any other plants subsequently divided with the same tools if it is a virus that can be transmitted mechanically. 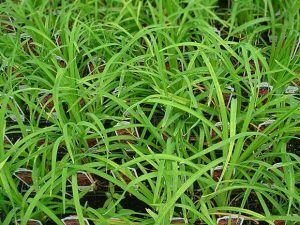 Also, there is the risk of pests carrying disease to healthy daylilies. The usual recommendation, therefore, is to destroy virus infected plants. However, as mentioned above, it can be difficult to differentiate virus symptoms from other disorders visually so expert advice is recommended before determining a course of action. Photo by Barry Menser, Michigan Department of Agriculture. Used with permission.